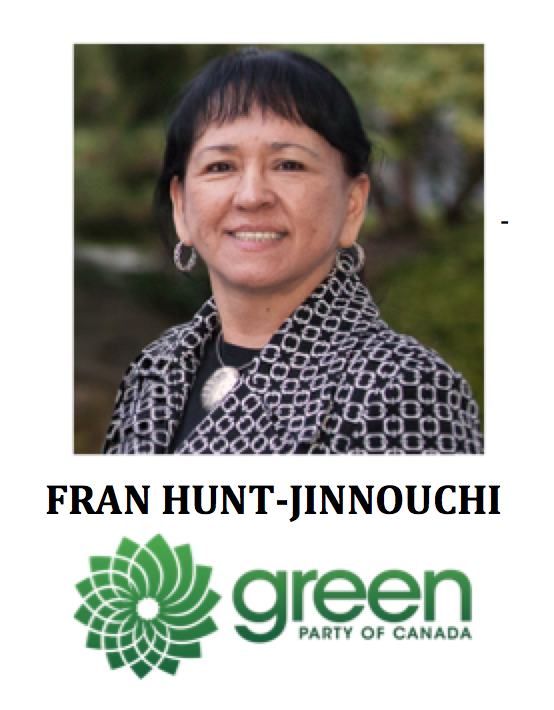 Fran Hunt-Jinnouchi, part of the Green Party ripple that leads to the wave that sweeps Vancouver Island? 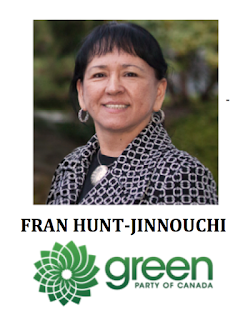 Fran Hunt-Jinnouchi is Kwakiutl/Quatsino ancestry and former Chief of Quatsino First Nation on Vancouver Island. 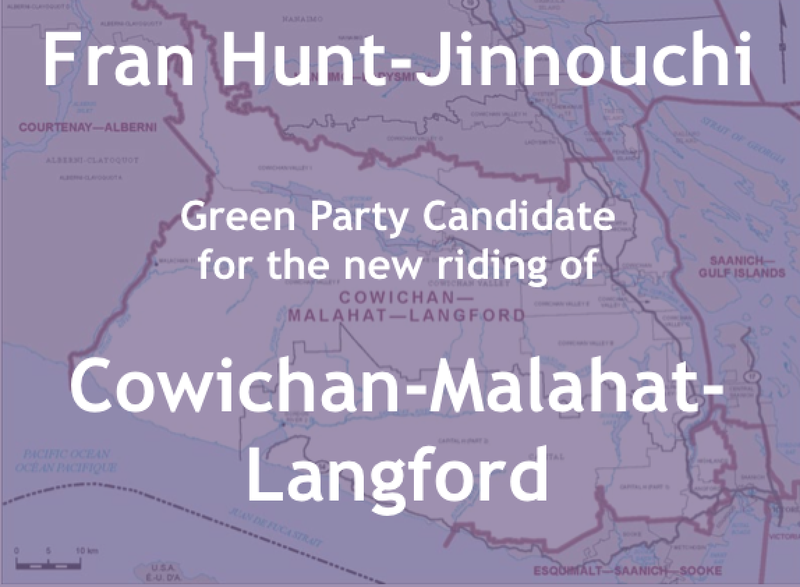 She is the Green Party of Canada candidate for the new riding of Cowichan-Malahat-Langford. -Fran has an impressive educational background that includes a Bachelor of Social Work, Masters of Adult Education and studies towards a PhD in Philosophy. -She is an entrepreneur who owns a bistro in Langford and is a consulting business focusing on community capacity building. -Her professional background includes: Director of the Office of Indigenous Affairs at the University of Victoria and Manager of the First Peoples House. She has also served as Director at Saanich Adult Education Centre. -In addition to being Chief, she has played a leadership role as Acting Principal at K’ak’ot’latsi School and Chair of the Indigenous Adult & Higher Learning Association. 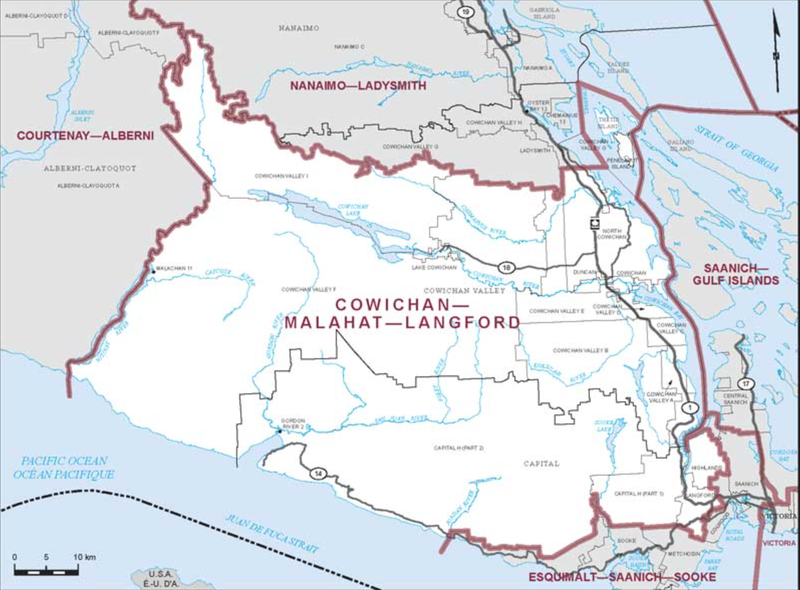 Cowichan-Malahat-Langford is a new riding created as a result of the 2012 Federal Electoral Boundaries Commission. 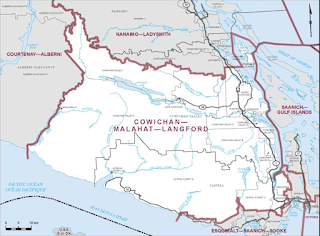 It is comprised of the former ridings Nanaimo-Cowichan and Esquimalt-Juan de Fuca. Neither of the MPs of the previously mentioned ridings will be running in this new riding. The riding has an Aboriginal population of 9.1% (2011). Polling aggregator ThreeHundredEight analysis suggests that if the Greens were to make a breakthrough it would be in BC for the most part, particularly Vancouver Island. 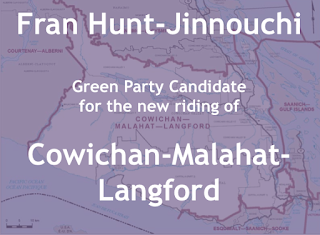 Consider Saanich-Gulf Islands where the Greens captured 10.4% in 2008 to capturing 46.33% in 2011 to elect Elizabeth May. The Greens put a great deal of effort and resources to get May elected and establish a beachhead. Vancouver Island may well be the beachhead that turns into a “Green” island. On a related note, Brenda Sayers was recently acclaimed GPC candidate for North Island–Powell River and will be profiled in a future blog.